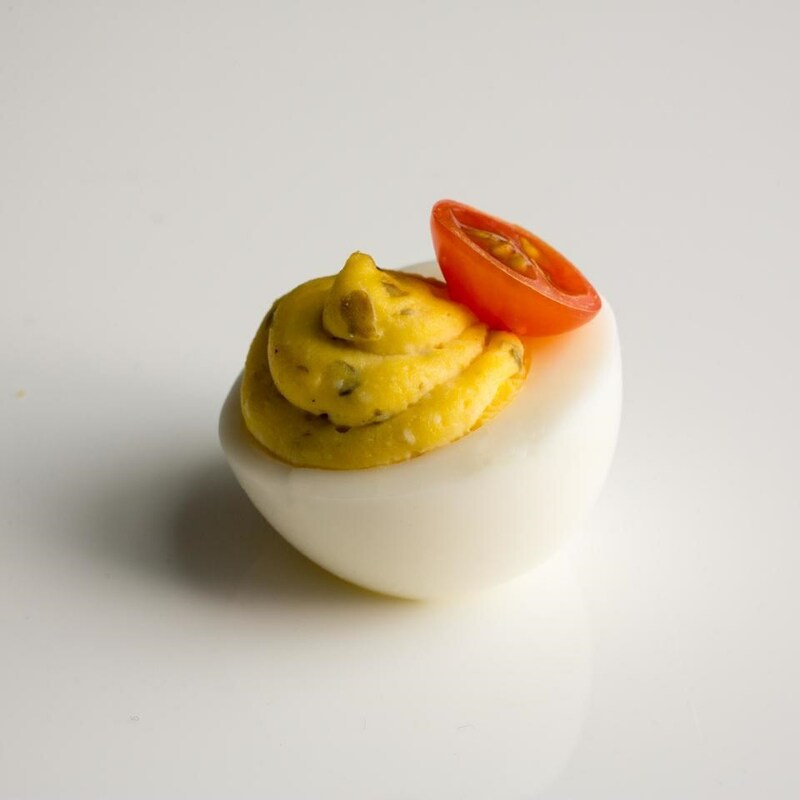 We take classic deviled eggs and transform them into Buffalo-style deviled eggs, deviled eggs with kimchi, Parmesan-caper deviled eggs and spicy Southwestern deviled eggs. Each of our gussied-up deviled eggs recipes starts with our easy deviled eggs master recipe. To keep them creamy while cutting calories, we've swapped half the full-fat mayo for nonfat Greek yogurt. A bit of Dijon mustard and white-wine vinegar perks up your taste buds. To transform this basic recipe into classic deviled eggs, simply add pickle relish and a dusting of paprika. Once you're comfortable making classic deviled eggs, it's time to start playing with the recipe—add a few dashes of hot sauce, some fresh herbs or chopped vegetables, some cheese and a few chiles, scallions or capers, and you have a whole new hors d'oeuvre for your party spread. Try one of these four recipe ideas, below, then start experimenting and make your own signature deviled egg recipe with your favorite add-ins. • Buffalo Deviled Eggs: In this recipe, deviled eggs get the Buffalo chicken wing treatment with chopped celery, hot sauce and blue cheese. • Kimchi Deviled Eggs: Kick up your deviled eggs with briny kimchi and gochujang (Korean chile paste). • Parmesan-Caper Deviled Eggs: Give deviled eggs an Italian accent with the addition of capers, Parmesan cheese and sliced grape tomatoes. • Spicy Southwestern Deviled Eggs: Chipotle peppers in adobe give these deviled eggs a spicy, smoky kick, while green chiles and fresh cilantro add a fresh flavor and a pop of color. If you've made all the above recipes, and want something new, feel free to swap out the ingredients in these recipes to customize your deviled eggs. Don't like cilantro? Use another herb like parsley in the Southwestern deviled eggs. Prefer olives to capers? An equal amount of finely chopped olives can work in the Parmesan-caper deviled eggs recipe. Go crazy with nuts, herbs, spices, bacon, avocado, different cheeses and so forth. Just remember to taste as you go—and that you can always add to the filling, but you can't take away.